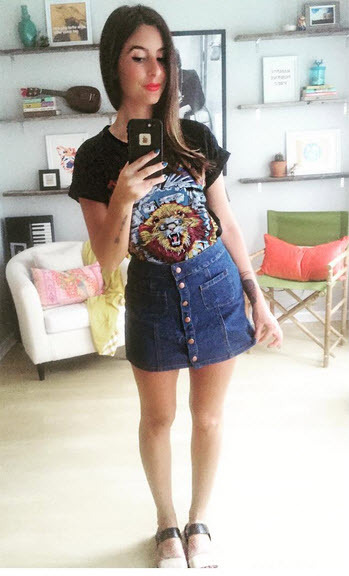 Here’s a sentence I never thought I would say: denim mini skirts are back. When I first heard this, I literally cringed. I have a lot of embarrassing memories of wearing tiny denim skirts with ripped hems and visible pockets hanging out of the bottom from Abercrombie and Fitch, pairing them with Uggs and a polo shirt. Who wants that kind of early 2000’s fashion back? No one. 1. Keep things simple with a white tee and a cute necklace. You really don’t need anything else sometimes! 2. Looking for fall outfit ideas? Add a sweatshirt, boots, and knee-highs. 3. For warmer days, a blousey top and gladiator sandals make for an easy but unique outfit. 4. Be fearless and choose denim on denim! 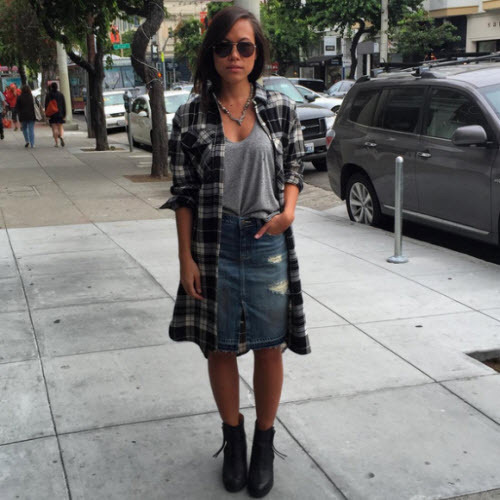 A light chambray shirt looks great with a dark denim skirt. 5. Sneakers and a cropped tee look casual and comfy with a denim skirt. 6. Add Oxford shoes, a cute hat, and a button-down shirt. This is such an adorable outfit! 7. 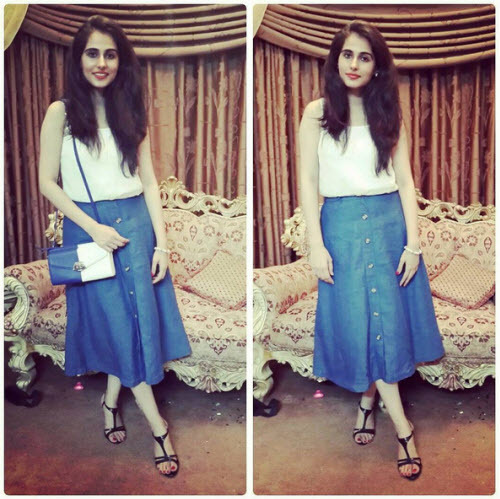 Opt for a longer pencil denim skirt and add a crop top. This is a great going out look. 8. 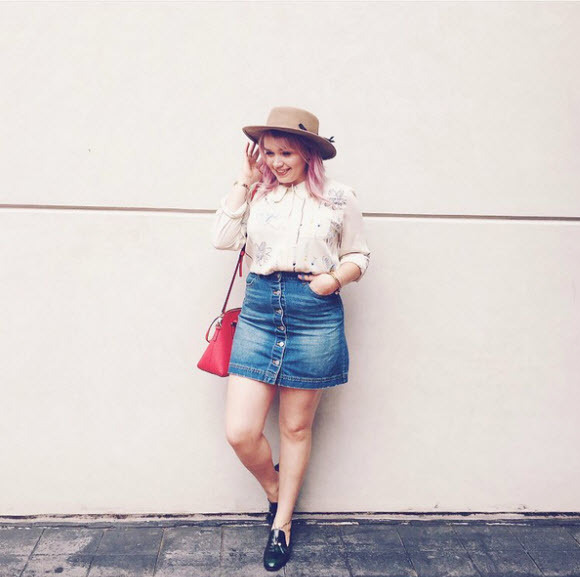 Make a denim skirt work for fall by wearing it with a hat and a long cardigan. 9. A silky top and heels make even a denim mini skirt look more professional. 10. 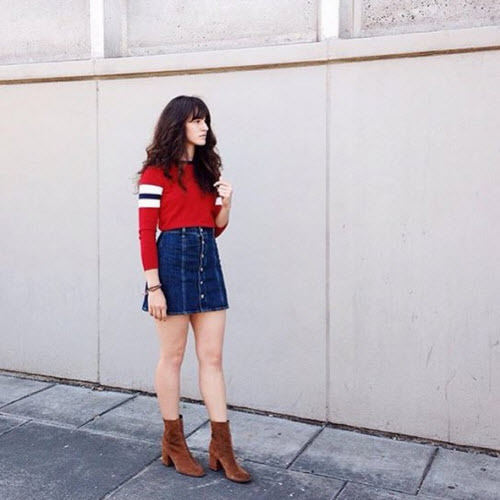 Think denim skirts can’t work for chilly weather? Here’s proof they look great with tights! 11. And also with turtlenecks! So cute. 12. Not into denim blues? Go for a black denim skirt instead. Seriously glam. 13. A striped shirt and white sneakers make a denim skirt look fresh and classic. 14. Not feeling the mini idea? 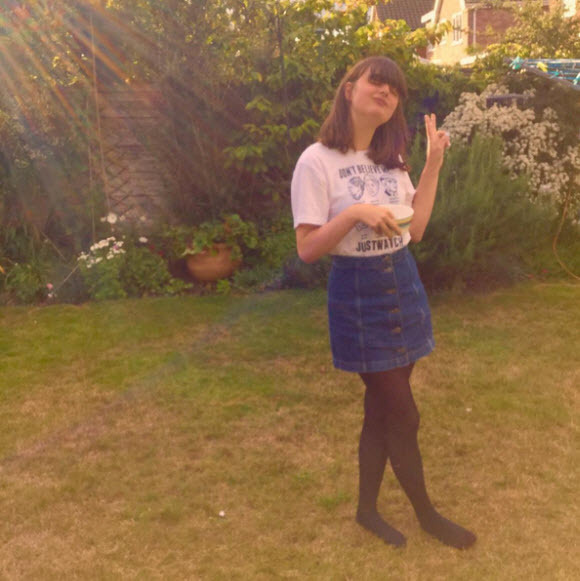 There are denim midi skirts! Look how cute this looks with a plain tank and bright accessories. 15. Add a plaid shirt to really have the ’90s vibes going on. 16. Fringe is another huge fall trend. Add a fringe vest over your denim mini to be super chic. 17. Sometimes all you need is a cute graphic tee. 18. For fall days, opt for a warm sweater and ankle boots. 20. A printed button down dresses up a denim mini skirt quickly. Look at those little strawberries!